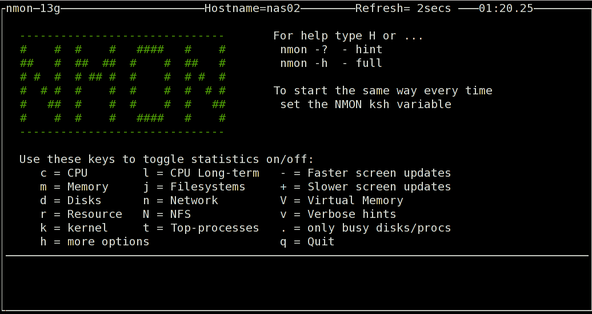 How do I install nmon command under Linux operating systems to find out performance information for my CPU, memory, network, disk, virtual memory, top process and other part of my HP server running on Debian Linux or CentOS Linux 6.x amd64 bit server? This systems administrator, tuner, benchmark tool gives you a huge amount of important performance information in one go with a single binary. 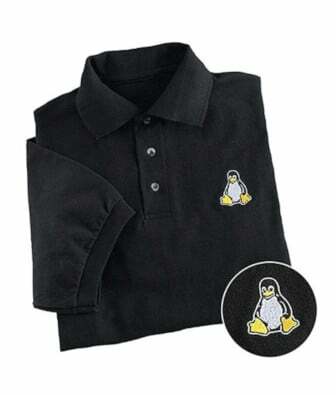 It works on Linux, IBM AIX Unix, Power, x86, amd64 and ARM based system such as Raspberry Pi. The nmon command displays and records local system information. The command can run either in interactive or recording mode. Need to get 52.5 kB of archives. After this operation, 164 kB of additional disk space will be used. Selecting previously deselected package nmon. You can download nmon binary version by visiting this page. How do I use nmon? q – To stop and exit nmon. h – To see quick help (hint) screen and press h again to remove the hints. c – See cpu stats. m – See memory stats. d – See disk stats. k – See kernel stats. 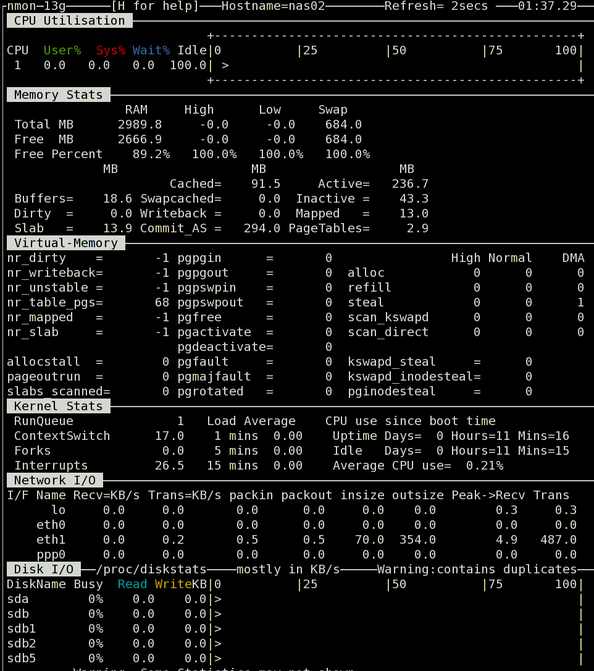 n – See network stats. N – See NFS stats. j – See file system stats. t – See top process. V – See virtual memory stats.
. – See only busy disks/procs. v – Verbose mode (display as Ok/warning/danger on screen). How do I set default monitoring options for nmon? -f : Start data collect mode and output in spreadsheet format. -s 2 : Wait between 2 seconds refreshing the screen. -c30 : Total number of refreshes (30). -t : Spreadsheet includes top processes. You need to download nmonanalyser which is an Excel spreadsheet that takes an output file from nmon and produces some nice graphs to aid in analysis and report writing. This page is great !! Htop is nice, but it’s not nearly as informative. For example, you can not see network traffic at all. And even some of the areas that Htop provides information on, it’s not nearly as in depth as nmon. Is it possible that it automatically output the result in a custom LOG FILE at regular intervals ???? It working fin for me. Hi I used nmon precompiled binary file to monitor my server (centos 6.4).Its recorded 230 kb and 630 kb data for 10 minutes.I used java nmon analyzer to see the graphs but it closed suddenly when I tried to open the file.I dont know why is it happened.I installed java and set environment variables successfully but this software didnt worked for me.Any help?Its very urgent for me. am not able to use nmon -F *********** command. What setting/config should be done in order to use the -F mode. Could someone breifly explain this. what if i want to uninstall this tool ? Is there a way to run this tool locally on a system to get the system stats of a remote machine over the network. The remote machine should not be installed with nmon tool at all. I dont think thats possible. We need to get the NMON installed on the machines which needs to be monitored. Thanks fos sharing knowledage on nmon……………. 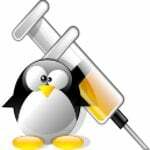 Could you please share the RHEL 5 version i686 nmon rpm package/ biniaries files. The Application is open source, Splunk itself can be used for free with Up to 500mb of volume indexing per day. The solution provides many interfaces to Analyse Nmon data and is compatible with AIX, Linux and Solaris. Thanks for the guide, very helpful, what if I want to uninstall NMON. Is there a document that defines the structure of the CSV file? i.e. for each record type, what data appears in each field. Where can i get such dependency ? NMON is invaluable now! Thanks for the concise tutorial. Installed without a hitch. Very Useful .. Thanks a lot.